Please tell us a bit about Sharp INTELLOS? The Sharp INTELLOS Automated Unmanned Ground Vehicle (A-UGV) is an autonomous, outdoor security robot that utilizes a navigation surveillance platform developed by Sharp to patrol predefined routes. It provides data through a durable cost-effective multi-terrain, mobile-sensor platform, capturing video, audio and environmental information, while providing a visible deterrent. The robot combines automation, mobility and a variety of monitoring and detection functions to extend the impact of a traditional security force. The Sharp INTELLOS A-UGV broadens the capabilities of a conventional surveillance, security, safety, and maintenance inspection; helping to reduce the number of field personnel required to do what is traditionally deemed the mundane tasks of guarding. Manpower is then free for other critical missions, thus expanding security coverage of your outdoor property. 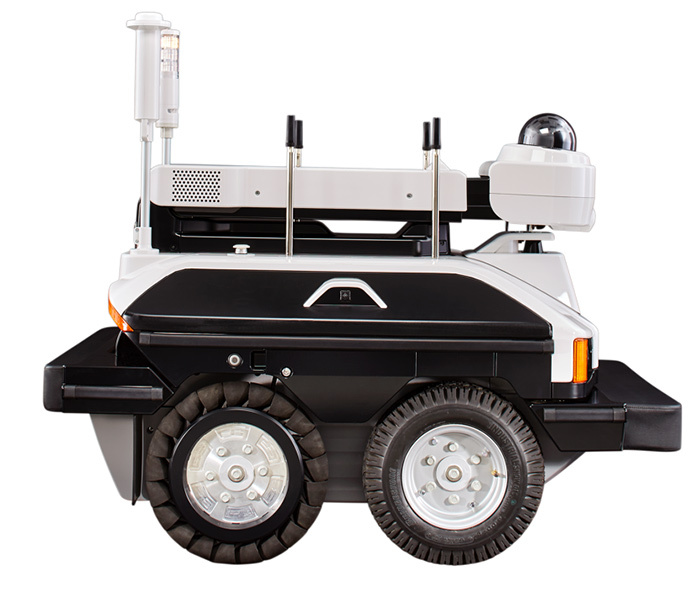 Moving and monitoring on its own, the Sharp INTELLOS A-UGV helps protect security personnel, property, and the public from threats and hazardous conditions, while adding a layer of protection to existing security infrastructure. Can you discuss a typical application for Sharp INTELLOS and how it is implemented and operated? Exterior fenced and guarded areas requiring consistent, routine patrol, due to inherent risk to infrastructure, assets and people, are ideal. Given the Sharp INTELLOS A-UGV’s ability to navigate on its own, it is able to also investigate safety concerns where manpower would be compromised. Suspicious intruders, potential fires, and gas leaks can all be inspected remotely. Expansive outdoor property can be inspected with little to no downtime. Implementing the Sharp INTELLOS A-UGV into your security plan becomes an advantage over your competition. This was a bonus that Sharp had not realized when we first started the project and has been shared by customers. Sharp’s outdoor robot will set you apart in two ways. Though it is a vehicle, it operates with zero emissions to the environment, which is typically valued in today’s corporate culture. As important, the Sharp INTELLOS A-UGV not only protects your assets, but the assets of your customers as well. This is especially important to fulfillment operations, data storage facilities and manufacturing warehouses. What should end-users consider before acquiring robotics for security? Robots are fairly easy to make today. Our Journey Video, introduced during ISC West 2017, articulated this best by pointing out there are a myriad of upstarts. To begin, consideration must be given to the history and staying-power of your robotics supplier - - - will it be around to offer you training on the product, provider service for the units in operation and mature with a fresh product to keep pace with the rapid evolution of your security needs? Also, be sure to “look under the hood”. Is the design clean, software user-friendly, and connectivity for vital data secure? Finally, has the unit been certified and tested? The expectation is that the robot will operate day and night, during all kinds of weather conditions and in the company of people. Reliability and safety are paramount to security, so invest in what has been validated. What role do industry standards play in the process? The complexities and emerging applications for robotics in security require oversight with the organizations governing them needing to keep pace. You need only think about the changes air drones have brought to flight safety operations. It is important to know that standards are typically not legal requirements. However, standards and certifications instill a degree of confidence in consumers. Standards are a “seal of approval” because they tell us that a technology’s performance, compatibility, reliability and safety have been evaluated. Is Sharp INTELLOS available today? What does it cost in terms of both purchase and setup? Absolutely. Sharp began taking orders for the Sharp INTELLOS at the product unveil during ASIS International 2016 in Orlando, Florida. Extensive pre-launch research told us that most customers would prefer to lease the units and pull from operating budgets, where guard service costs reside. Given this would not be the case 100% of the time, Sharp offers a variety of acquisition methods. Traditional human guard services nationwide average $16/hour. The Sharp INTELLOS A-UGV cuts that cost in half over a three-year period, regardless of the robot being purchased or leased. Every complex is unique, so a complete site assessment is done with each prospect, which makes clear the acquisition price and setup requirements. What are some organizations working within the industry to roadmap robotic applications and usage? In the security robotics space, look towards the National Institute of Standards and Technology (NIST), the International Standards Organization (ISO) and the Robotics Industries Associations (RIA) for governance. NIST is one of the United States’ oldest standards organizations. Though federally funded to promote national innovation and industrial competitiveness, it is a non-regulatory agency of the U.S. Department of Commerce. ISO is a global standards entity and has certified the Sharp INTELLOS A-UGV for safe operation around people. RIA, North America’s leading robotics trade group, developed the first American national robot safety standard in 1986 and continues to evolve as applications change. How quickly do you think the corporate world will embrace technologies, such as those offered by Sharp INTELLOS? A big change over the last few years has come to Fortune 500 companies. They are now assigning robotics and automation task forces to explore this emerging technology as a key to profitability improvements. It has become critical to their corporate goals. The market is educating itself and that education will accelerate adoption. 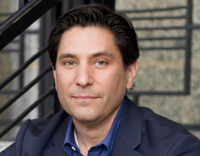 Cliff Quiroga leads a global team of researchers and engineers as well as drives the business development and marketing activities of the Sharp Robotic Business Development (SRBD) team. With over 25 years of engineering, product planning and management experience, Cliff is one of the youngest Vice Presidents in Sharp Electronics Corporation’s history.